Published by Joshua Clare-Flagg on 21 Apr, 2017. When I first saw the advert for the Thomas Earnshaw Cornwall Bridge, I was rather excited. 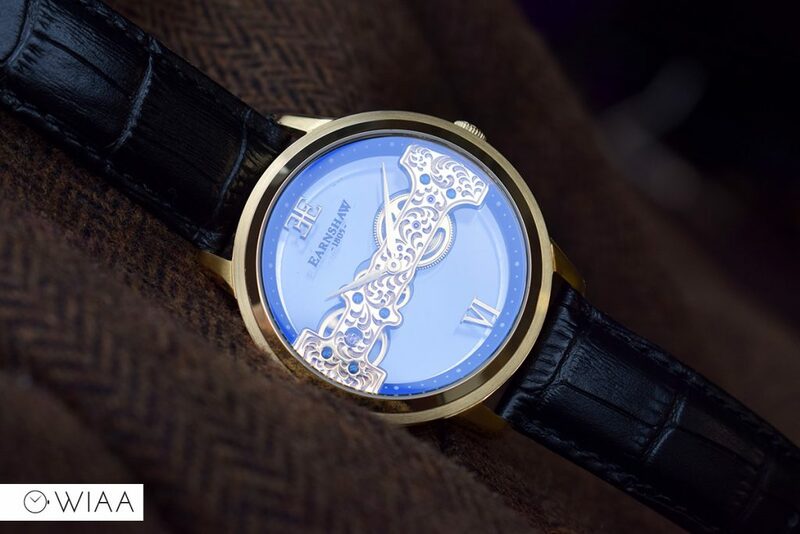 At a glance, it’s hard to deny that it looks a stunning timepiece and Bridge movements are used few and far between. 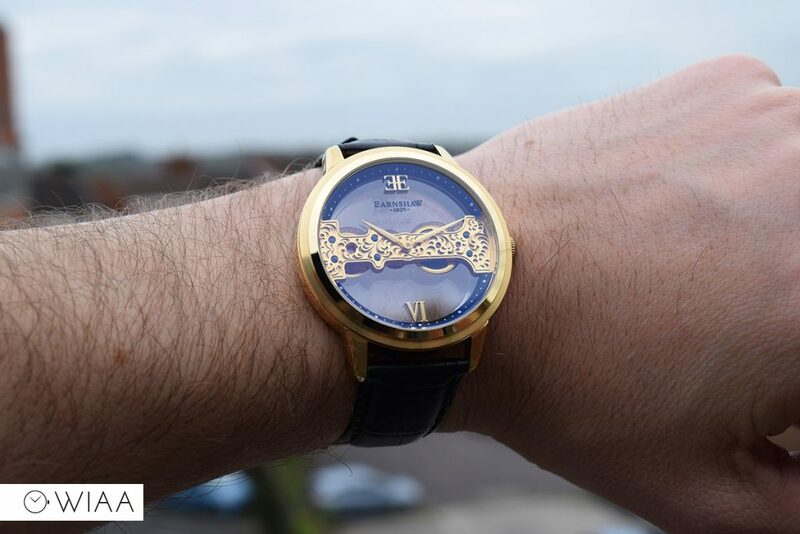 First things first, the watch is marketed as the “Cornwall Bridge Automatic”. 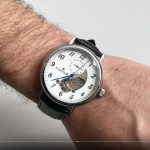 I’m sure you’ve come to realise that it’s a hand wind only watch and is not automatic in the slightest – so that’s a bit embarrassing for them. 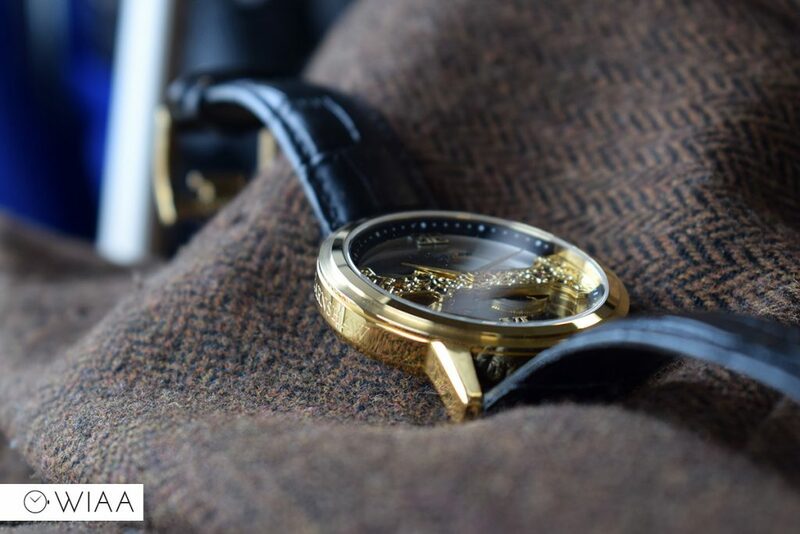 Let’s take a closer look to see if it’s a decent watch for the money and overlook that. 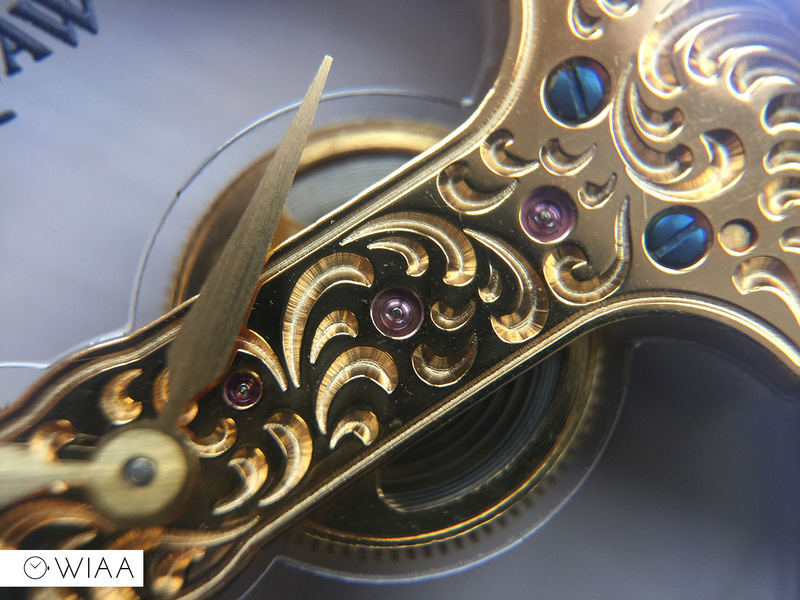 What’s there to say really about the dial apart from there isn’t one? 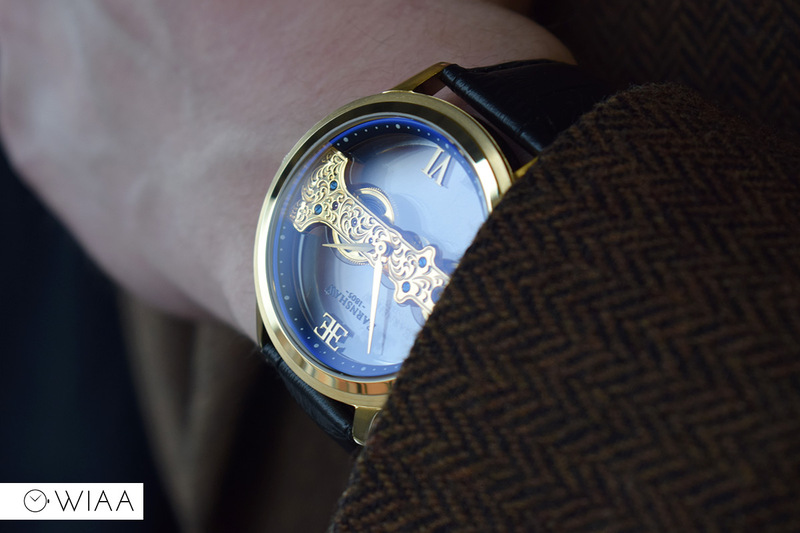 The bridge / baguette movement provides a pleasing and unusual backdrop to this timepiece. 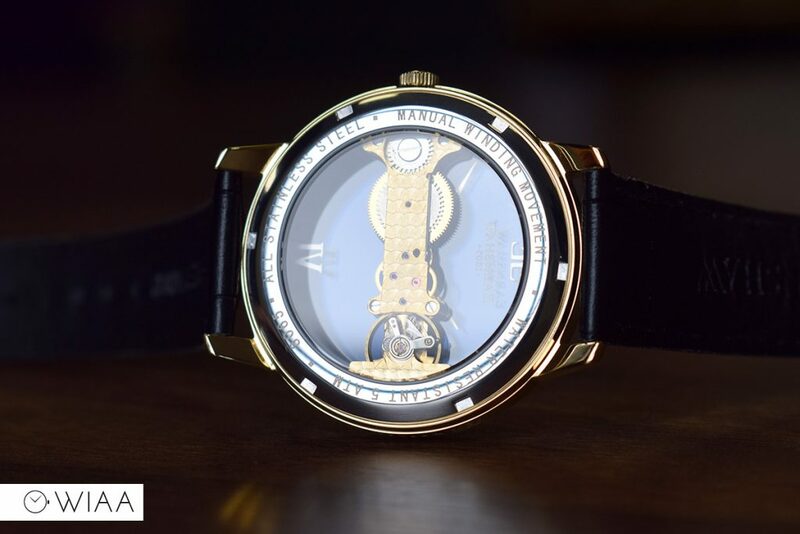 There is technically a dial, but it’s a transparent disc which the logo is printed on and the applied hour markers at 12 and 6 are connected to. 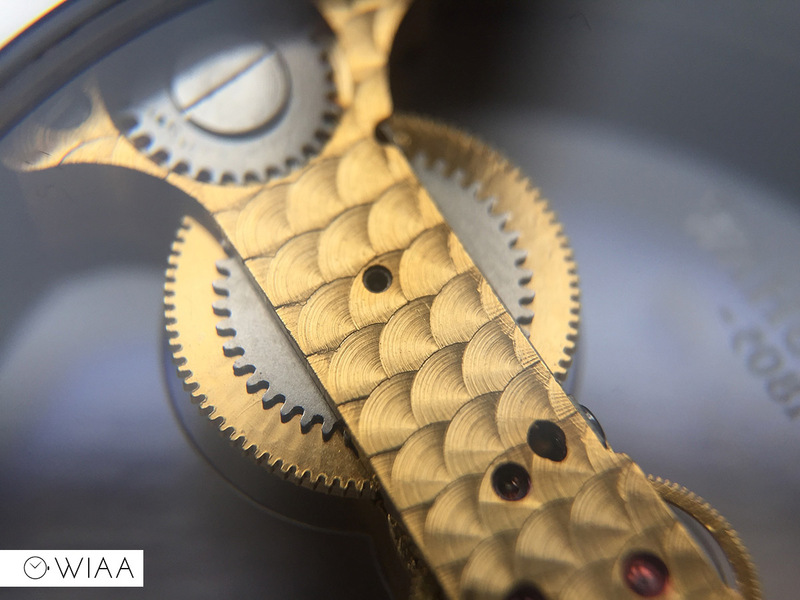 These applied hour markers are very well done indeed, accurate and finely finished. 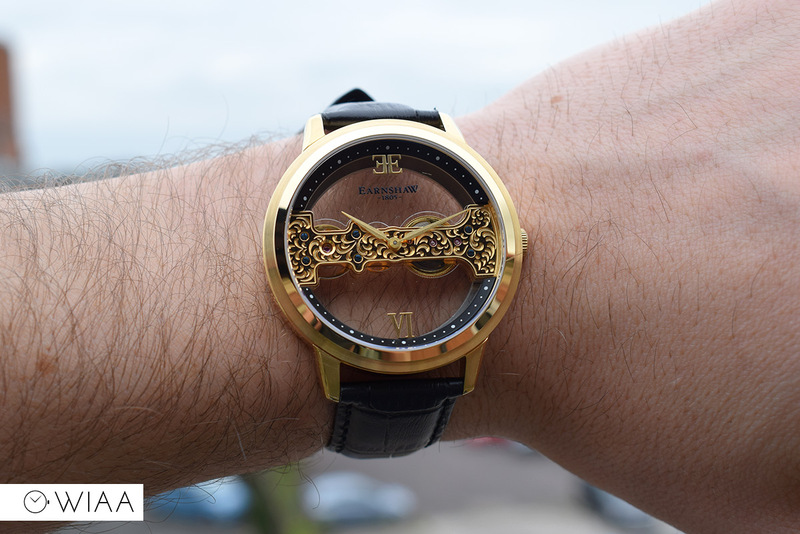 There is the double E logo at 12, and 6 in Roman numerals at the base of the dial. 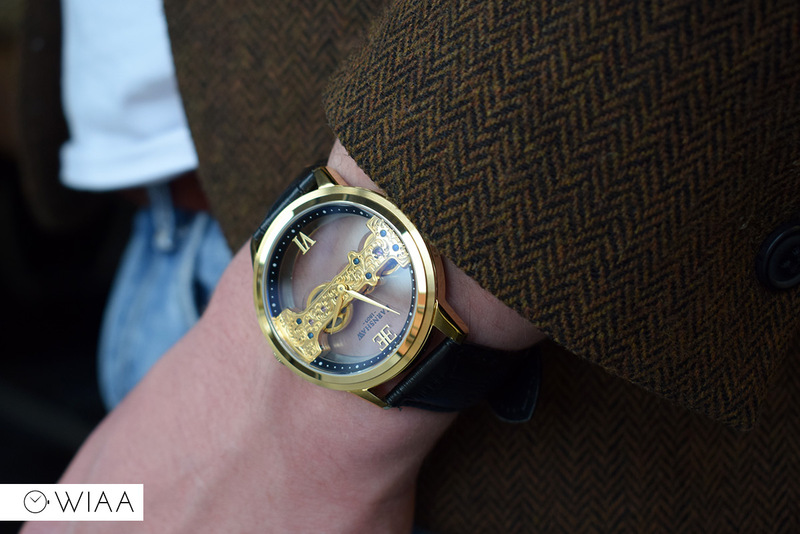 The pitched dauphine hands are gold to match the movement. 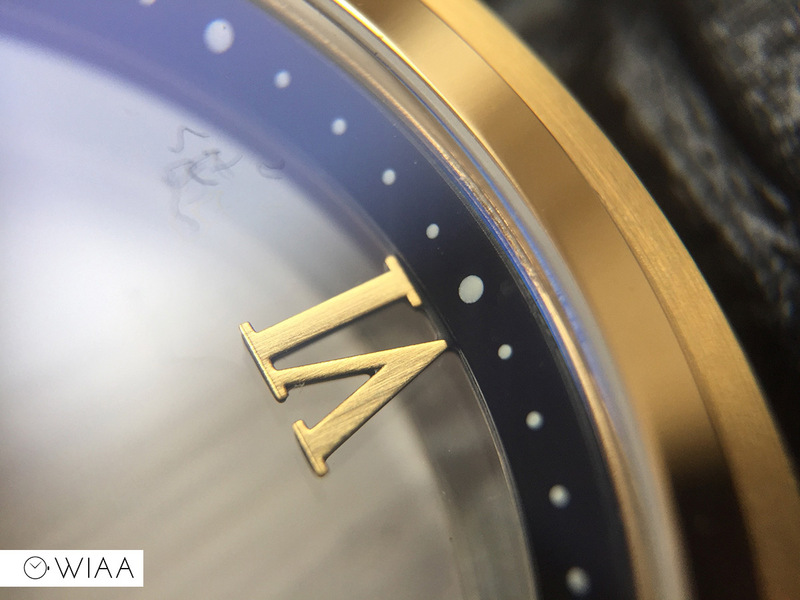 They have a brushed finish and are very well executed, however it can prove to be difficult to read the time when they’re sitting on top of the movement – such as 9:15. 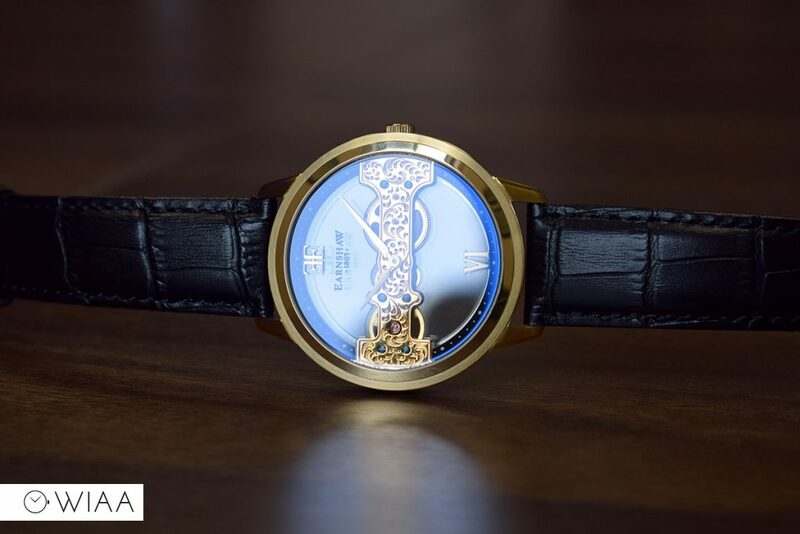 Surrounding this void is an elegant blue rehaut, which sets the tone nicely and works well with the yellow gold case and movement. 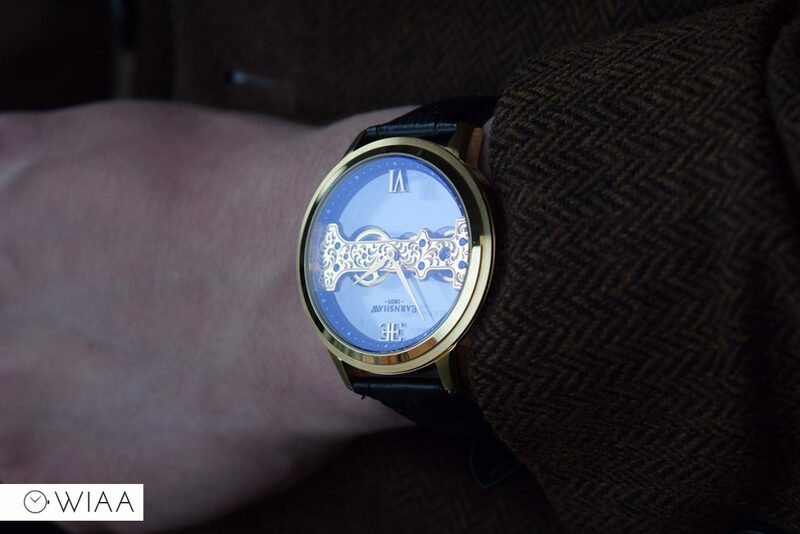 The case is yellow gold plated and definitely provides wrist presence – whilst it is on the large size at 42mm in diameter, due to the transparent nature of the watch it doesn’t wear that big. 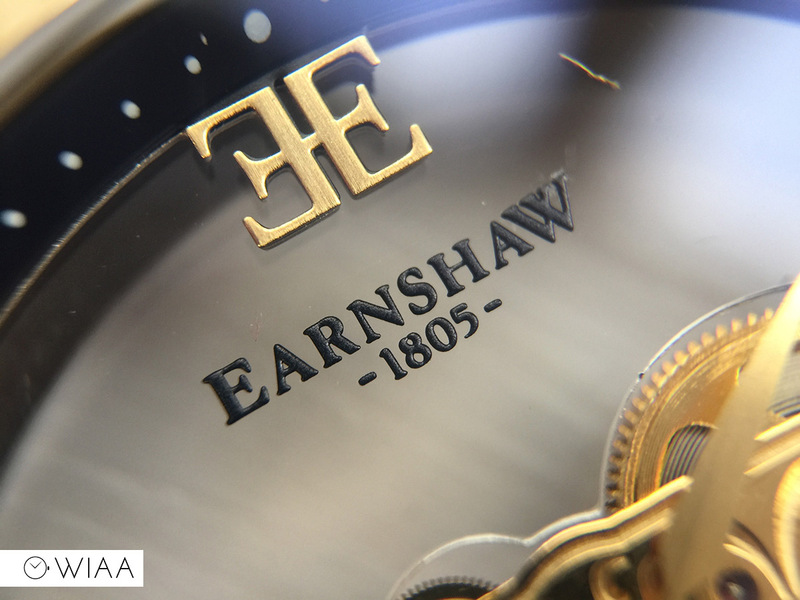 As is their custom, they have Earnshaw engraved down the side of the case, which is deep and neatly done. 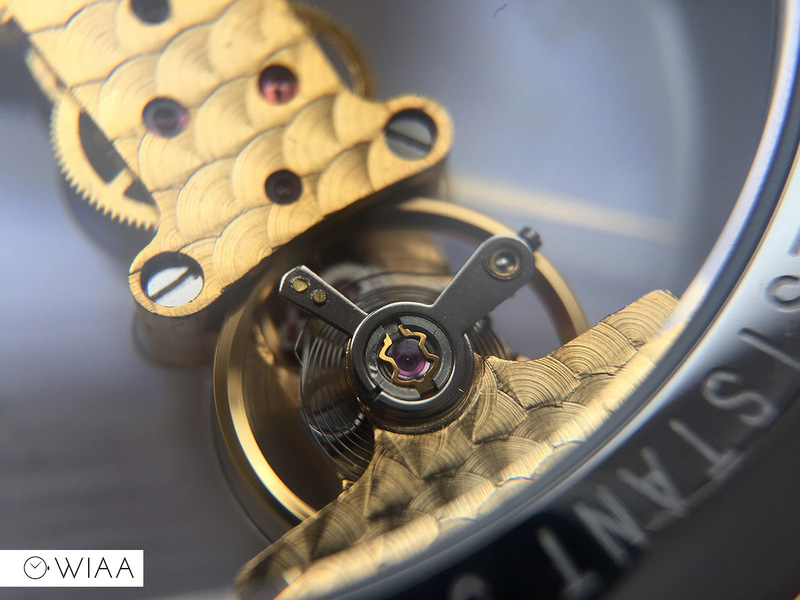 The screw-in caseback is steel, with a large exhibition window with details surrounding it. 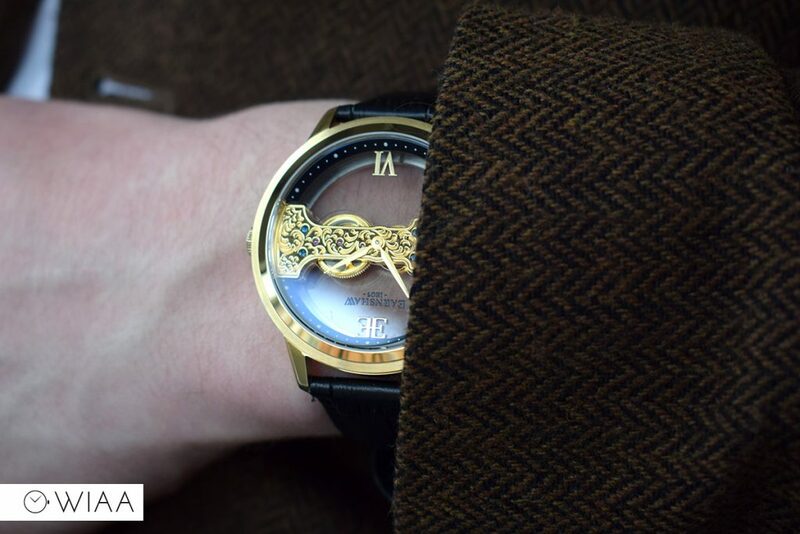 It’s a shame it’s not gold plated to match the case. I believe mineral crystals have been used on the top and bottom. 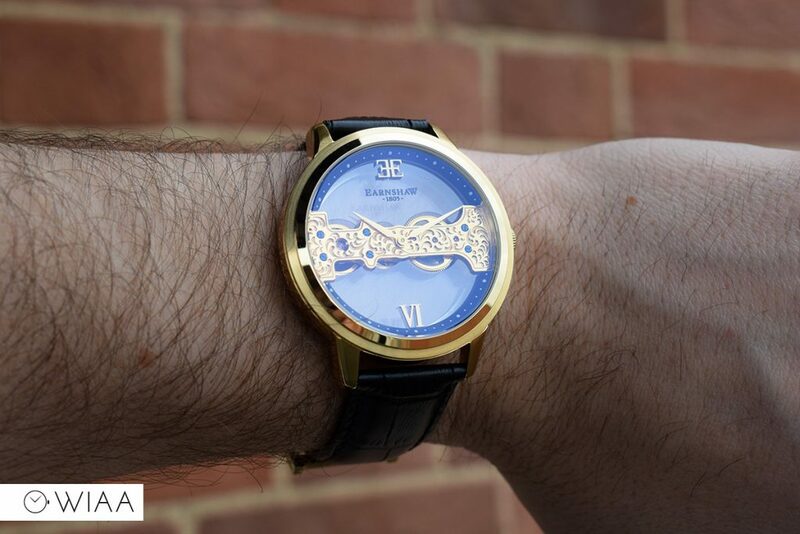 For a watch costing £410, personally I think they should be no less than sapphire. 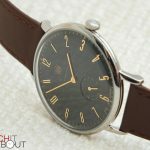 Now we come up to the worst part of the whole watch – the crown. It’s simply unusable. 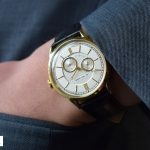 Of course, it’s a hand wind only watch, which naturally means you need to wind it every two days at least – but it’s just too small to use. 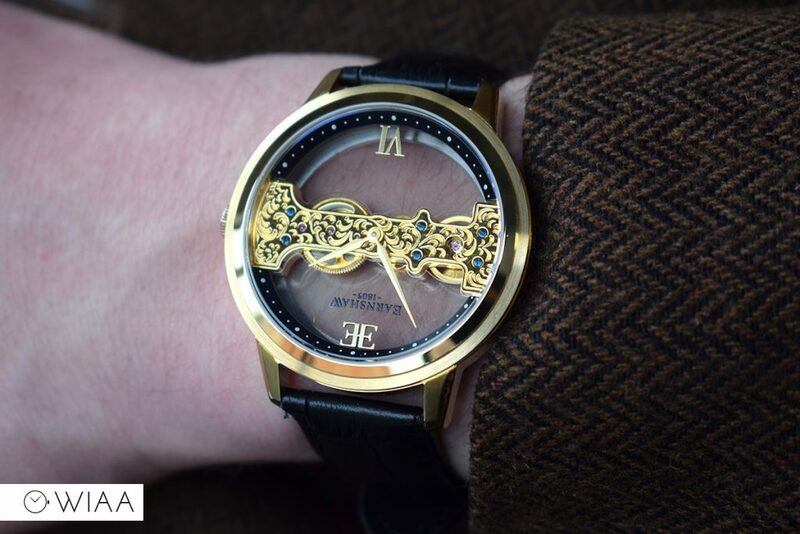 It’s a nightmare getting any sort of grip on it, it’s even difficult to pull out to change the time. I’ve developed a technique to wind it – sort of pushing my thumb flat on top of the town and twisting it. It’s not really ideal as it’s putting strain on the movement but it’s the only way to easily wind it. I’m pretty perplexed by this – surely they would have tested something like this. 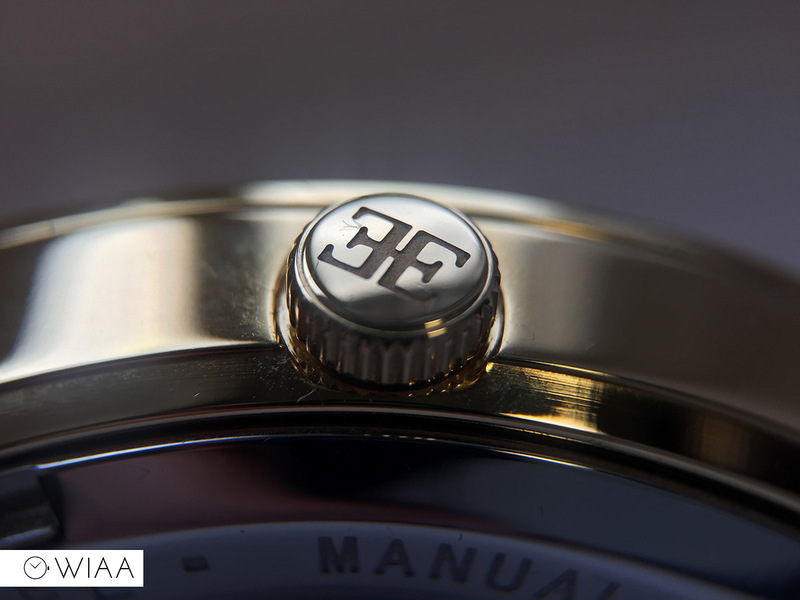 It has the double E logo engraved on the end. The strap is thin, but lovely and supple. 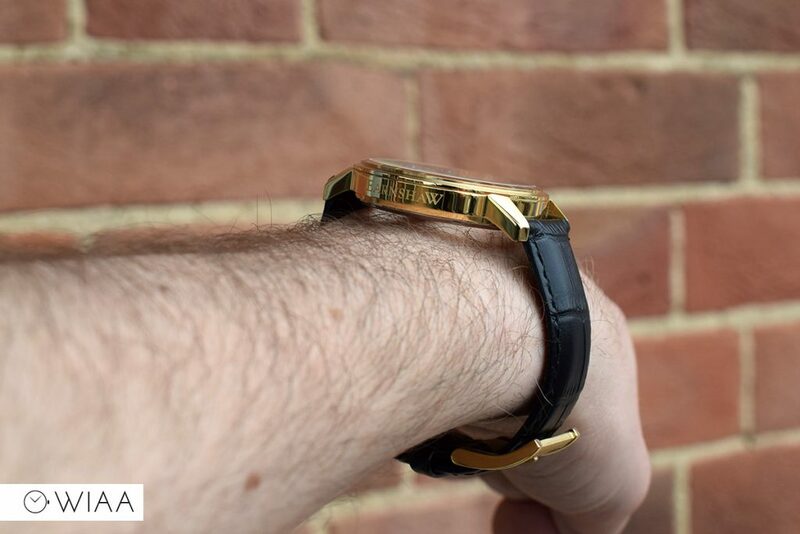 The thinness of it helps it to be very comfortable on the wrist, but it still feels good quality in the hand. 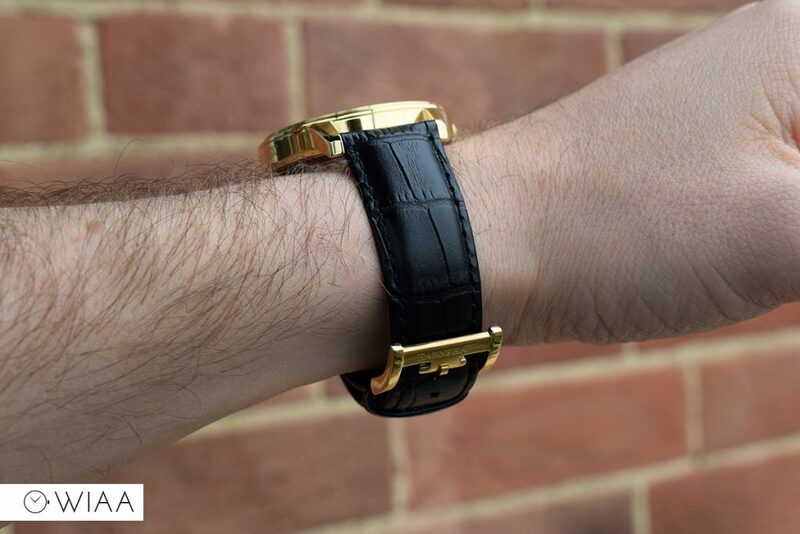 The strap has another slight flaw – the buckle. 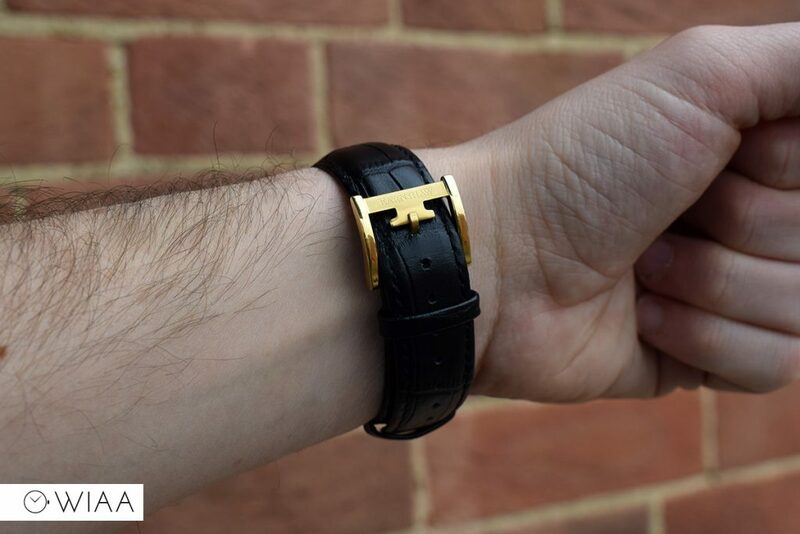 Whilst it looks good as the top bar is in a shape of the E logo, that usually ends up wrecking the centre of the strap due to the strain on it. 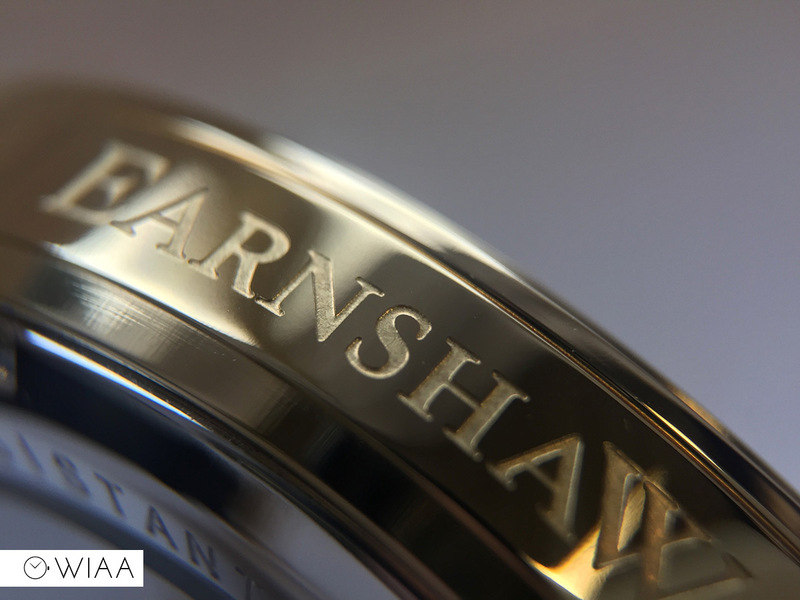 The brushed top bar has the Earnshaw logo engraved, with polished flanks. 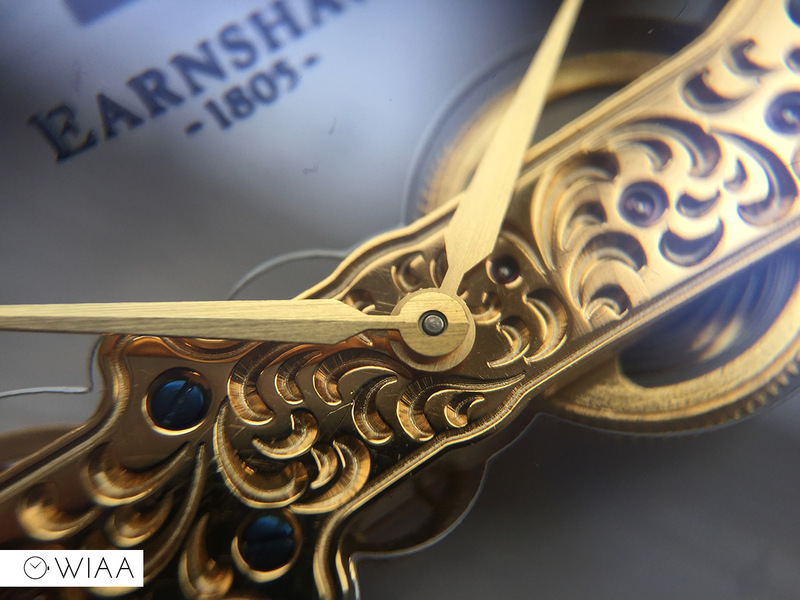 The movement powering the Thomas Earnshaw Cornwall Bridge is the PTS JQ-005. It looks nice and certainly creates a luxurious appearance, but under close inspection there’s a few marks and signs of budget finishing. 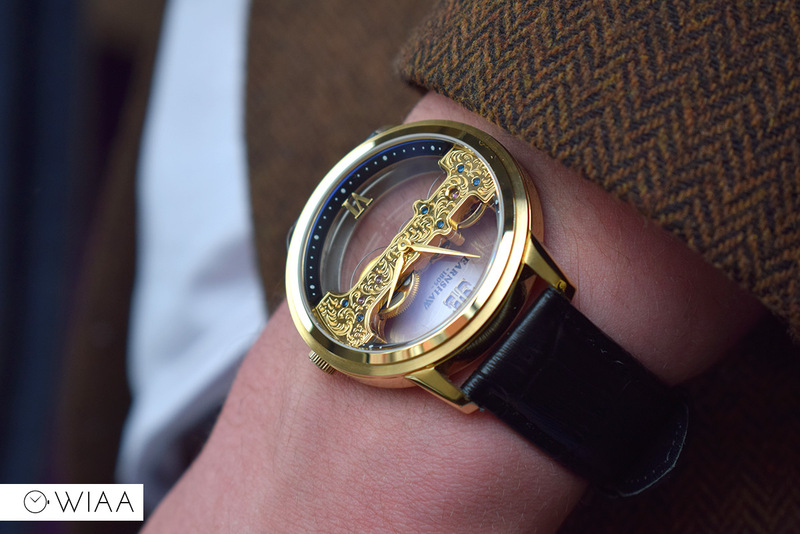 It has a 36 hour power reserve once fully wound, and runs at 21.6k bph (6 ticks per second). 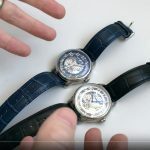 It’s not too often that I’m critical of a watch. 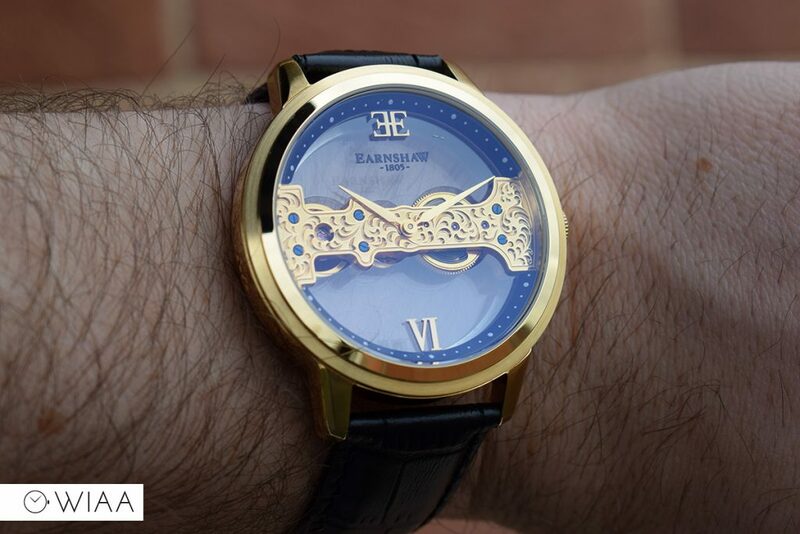 But, I strongly feel that Thomas Earnshaw should have though about this a little more. It’s constructive criticism, not just a good ol’ moan. 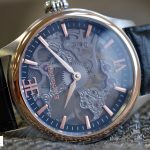 Firstly marketing it as an automatic makes them look unknowledgeable, and then the crown is so small it makes the entire watch hard to use. 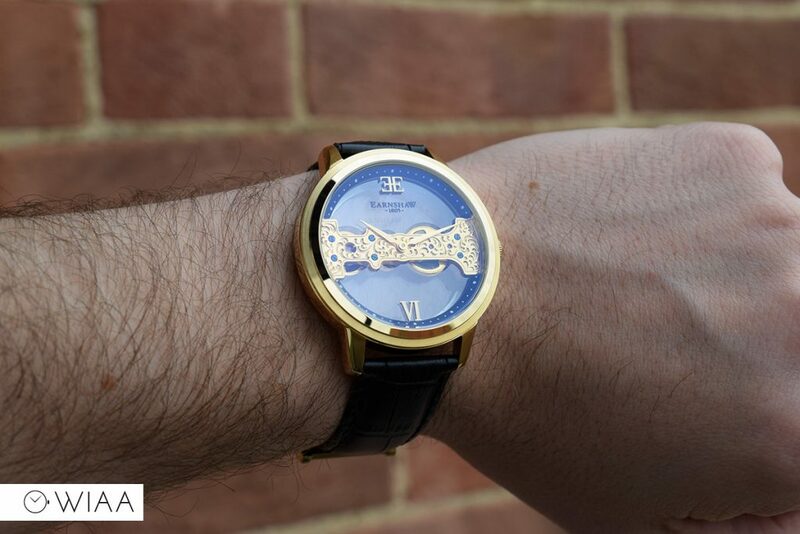 The RRP of £410 seems to be too much for a watch with a Chinese mechanical movement and mineral crystals. 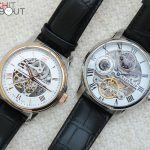 However, there’s no denying the Thomas Earnshaw Cornwall Bridge does really look the part and if you’re happy to overlook the issues and can get it at a bargain price then it’ll be a watch that fits in well on the wrist in any smart situation.